Welcome to our brand new website! If you had an account on our old website please see the instructions here. Northampton Janitorial Supplies are an efficient and affordable on-line retailer, for businesses, of cleaning supplies, cleaning equipment and janitorial products in the UK. Our distribution centre is located centrally in the UK so we are able to deliver fast anywhere within the Northampton area or further afield around the UK. 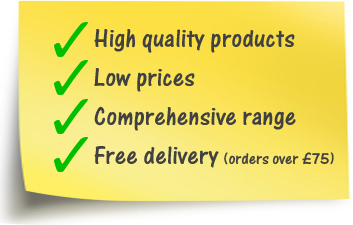 We have built our reputation on a fast and friendly service and high quality products. Call Northampton Janitorial Supplies now on 0845 130 4598 to find out how we are changing the way people buy cleaning and janitorial products.